Description A cosmic embrace 60 million light years away. 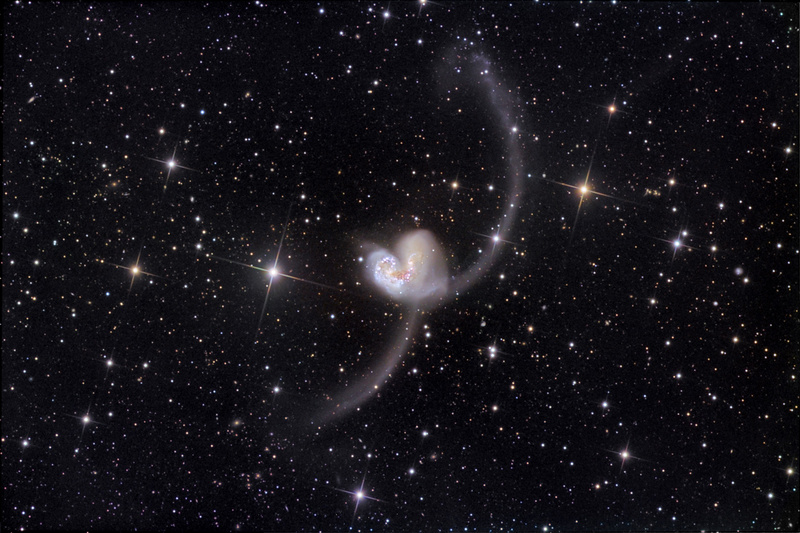 Shorter exposures show the brightest features of these interacting galaxies as a mirrored question mark or a ringtail. Deeper exposures, such as the one shown here, reveal two filaments about 8 resp. 12 arc minutes long that emit strongly in radio wavelengths and were created by the tidal forces of the collision process. These forces also trigger not only new star forming regions, but even a new galaxy: the brighter bluish area near the end of the top (southern) arm is NGC 4038S, a so-called TDG: Tidal Dwarf Galaxy. Click on the image for higher resolution. The field of view is 25 x 37 arc minutes with north towards the lower left. Here is an earlier, narrower field image.